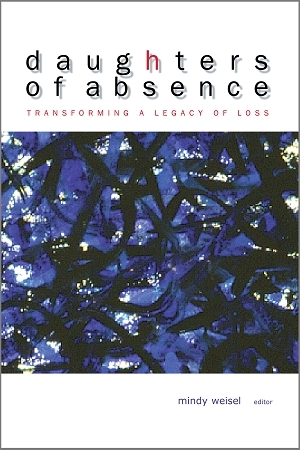 Daughters of Absence is a collection of twelve essays written by daughters of Holocaust survivors. Each chapter is a contribution from a female author, poet, artist, musician, filmmaker, comedienne, playwright, and more. The authors not only tell about their own personal experiences as daughters of Holocaust survivors, but many essays also include accounts from their parents of horrific experiences during the Holocaust. Despite the unique pressures of being the daughters of "survivors," the contributors have thrived and made the most of their lives, but not in stereotypical ways. Instead, they chose ways that combine compassion with courage, and success with celebration. The result is an uplifting and very inspiring book from a group of very inspiring women. The contributors include editor Mindy Weisel, an artist whose works are on display at museums around the world; Helen Epstein, author of Children of the Holocaust; Aviva Kempner, producer of the films The Partisans of Vilna and The Life and Times of Hank Greenberg; Lily Brett, the only writer who has won Australia's highest awards for fiction and poetry; photographer Vera Loeffler; poet Miram Morsel Nathan; and Hadassah Lieberman, wife of Senator Joe Lieberman. The introduction is by Eva Fogelman, author of Conscience & Courage: Rescuers of Jews during the Holocaust. This book has been used in the classroom and at seminars and conferences. It was previously available only in a hard cover edition, but it is now available in trade paperback and e-book editions. Highly recommended because of its unique perspective on the Holocaust and because each chapter demonstrates the strength of the human spirit. Please help spread the word about this wonderful book. Daughters of Absence was compiled and edited by Mindy Weisel, a noted artist who is included in the American Archives of American Artists. Her art hangs in museums and institutions around the world, including the Smithsonian Institution, Hirshhorn Museum, National Museum of American Art, Israel Museum, Baltimore Museum of Art, and the U.S. Capitol. Her work has been featured in thirty one-person shows and numerous group exhibitions. Ms. Weisel has been nominated for awards in the visual arts and is a partici­pant in the U.S. State Department's Art in Embassies Program. An interview with her about her art and life aired in 1997 on CNN's Impact. Her work has been reviewed by the New York Times, Washington Post, USA Today, Art News, and more. She is the author of Touching Quiet: Reflections in Solitude. Mindy Weisel resides in Jerusalem, Israel, and Washington, D.C.